The Open Day was held at the Recreation Room on High Street from 11.00am to 3.30pm and during the day between 180 and 200 people passed through the doors. 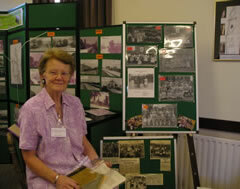 The main theme for the Open Day from the History Group was 'Streets of Beckingham' and there were old photographs on display showing Beckingham in the early 1900s. Many of the photographs (from Peter Mason's collection) had been taken by Miss Julia Tong who lived at The Spinney on Low Street. She came from a wealthy family who were big land owners in and around Beckingham and Tong's Wood still exists today. The Web Team were also there on the day to promote the site and talk to people to gain more material for future pages. 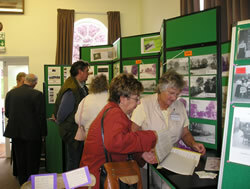 Visitors on the day were encouraged to bring in their old photographs and other memorabilia and a wonderful framed poster (click here to view) was brought in by Peter Hepton. 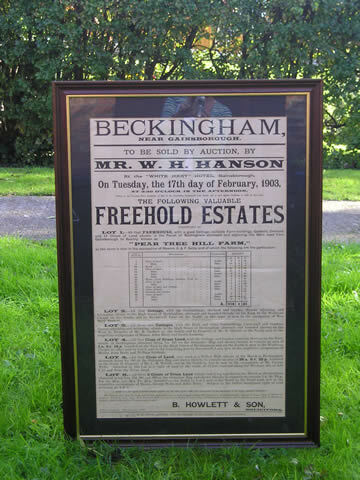 The poster advertised the forthcoming auction of Pear Tree Hill Farm at The White Hart Hotel in Gainsborough on 17th February 1903, and had been donated by Steve Hardy from The Croft who has since left the village. John Smith brought in a couple of old photographs, one was of Pinewood Hospital (known as a 'fever' hospital) which was on the Walkeringham Road. It was used to treat diptheria patients and an ex resident of Beckingham, John Taylor, remembered going there with scarlet fever. Another photograph was of the vehicle used to transport patients to the hospital. The hospital burnt down many years ago and the house on the site today is residential. Another theme on the day was 'teacher's corner' which included a teacher's chair, a child's desk and chair and an old abacus belonging to the school. An easel showing school photographs over the years drew a lot of attention, especially from those visitors that had attended the school and there were examples of school work and a wonderful extract from the Headmaster's log dating back to the 1800s. Some visitors on the day had since left the village, such as Peter Elmes who had lived at Marsh Farm (since demolished) and Alan Williamson from Thistle Farm. Alan Williamson recalled letting his field out to the village and school prior to the Village Playing Field being created and Peter Elmes recalled his days of 'Scrumping' at a nearby farm. Canon Levick was another welcome visitor who had been involved in the consecration of Beecher Lane and Peter Jackson who had helped build the Millenium Stone feature on The Green. Alongside one wall were tables with historical artefacts relating to the village, such as old newspapers, articles, tools and railway memorabilia. Peter Mason's files once again drew lots of interest and there was a steady stream of people flicking through recapturing the nostalgia of bygone days! 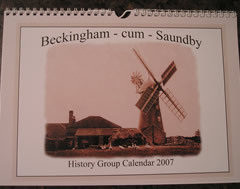 Albert Phillipson held an ongoing slideshow with old and new photographs of Beckingham and Saundby which included photographs that have been used by The History Group in the Beckingham and Saundby 2007 calendar. The Open Day was a launch for this and shows the 'Old' and 'New' Beckingham and Saundby through the seasons. The calendars had been specifically designed and created for the residents of Beckingham and Saundby and every household is to receive a complimentary copy.